But you don’t have years do you? I totally understand. When you need money, when you need a loan, you can’t wait to increase your credit score to get rates you can afford. You need to apply for a loan now and waiting years just isn’t going to happen. I learned that the hard way trying to rebuild my own credit score in 2008 and it forced me to learn everything out there about boosting my FICO. I ended up increasing my credit score by 100 points within six months and I now have a score of 801 on the FICO scale. That means I get all the advertised rates on mortgages, car loans and personal loans. I’m going to reveal everything I did to fix my credit score in six months and everything that has helped me boost my FICO since then. First, you have to understand why you have bad credit because it will mean different strategies in fixing it. Do you have no credit history? The average credit score for people under 30 years old is less than 600 FICO because this limited credit history really hurts you. Have you destroyed your credit by missing payments or letting loans go to collections? It happens, happened to me but you can fight back. If you just don’t have much of a credit history, the solution is to apply for a couple of credit cards or loans and start building a good payment history. This accounts for more than a third of your credit score and will also affect things like your credit utilization ratio. Understand that getting a credit card isn’t going to help your score if you max it out and then can’t pay the bills. You have to pay off your balance (IN FULL!) every month or you’ll be paying thousands in interest. The trick to rebuilding a credit score after ruining it is more complicated so that’s what we’ll focus on for the rest of this article. Reaching a credit score of 700 FICO, a good start on a great score, takes about two years if you’re starting from scratch. That means opening a few card accounts and charging on them and paying them off regularly. It’s more difficult if your credit score has crashed because those missed payments and collections stay on your credit report for years. That’s going to hold back your credit score but we’ll talk about ways to get around it. My credit score bottomed around 560 FICO in 2009 after missing payments on rental properties and credit cards during the housing crisis. By the end of 2010, I had built it back up to 660 FICO and was on my way to getting out from the bad credit trap. Because bad credit is a trap. Lenders secretly love bad credit borrowers because who else can they charge 36% annual interest and they know they’ll get it because the borrowers don’t have any other options. If you’re paying 36% and higher rates, you’re not able to do much else with your money so you’re always going to be stuck in that bad credit trap. Using the credit score hacks I’ll talk about next helped me increase my score to 700 within 18 months of destroying my FICO and put on 200 points over the next few years. The first thing to do is to figure out exactly what is on your credit report. I know it can be scary because you know it’s not pretty but you need to get your free credit report from Annual Credit Report, the only free credit report service by the government. Once you know what’s on your report, you can start disputing and negotiating those bad marks. Disputing a bad mark means writing a letter to each credit bureau telling them the missed payment, collections, etc. shouldn’t be on there. Negotiating a bad credit mark means calling the creditor or collection agency to work out a plan and get the mark removed. Disputing stuff off your credit report is easier but isn’t going to work for everything. If there are any mistakes on your report, those will be easy but you might also be able to get a few missed payments removed especially if they are on closed accounts. Understand that collections agencies and creditors just want to collect on the account, they don’t care what’s on your credit report. If you do have bad marks on your report, offer to pay 20% of what you owe if they’ll remove it and close the account. You might have to negotiate up to paying 35% of the debt but it’s a great way to increase your score and finally get out from under that debt for less than you owe. Warning: You may be tempted to hire a debt negotiation company to settle your debts. This will take years and will ruin your credit worse than it is now, besides costing thousands of dollars. Try the two steps above and the tricks below first. Getting any bad marks removed from your credit report will instantly increase your score. My FICO jumped 40 points in less than three months from negotiating and disputing. To get the rest of the way to a good credit score, you’ll need a few more tricks that take a little longer but can really add points. Get a credit limit increase so you’re not maxed out on your cards. This doesn’t mean spend more. It just makes it look better if you owe less than your credit limit and helps to boost your FICO score. If you don’t have at least two credit cards, open an account and start using it each month. You need to build good credit history to offset the bad credit history you have on your report. This means using credit and paying it off each month. Add your monthly rent to your credit report with a service like RentTrack or RentalKharma. These are online services your landlord can use to report rent payments on your credit report to help you build that good credit history. Mortgage lenders can use a system called Rapid Re-Scoring to get disputes and other credit report fixes pushed through faster. This means you don’t have to wait the usual 30-days to boost your score. 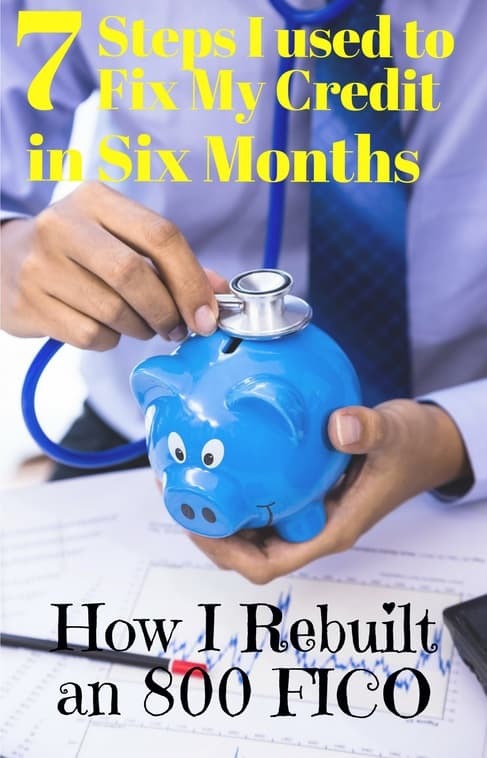 Using just these credit score tricks, I was able to boost my score another 30 points within six months and make my FICO really start growing. There are just a couple more credit tricks I’ve used to rebuild my score over the longer-term. Make sure everything good is on your report. We always focus on getting the bad remarks off our credit report but getting more good items on there can help just as much. Make sure your credit cards and all your debts are reporting your monthly payments. Getting a co-signer for a loan or even co-signing for someone else’s loan can be a great way to build credit history. Make sure you can afford the monthly payments or trust the other person to make their payments (duh!). You can use this loan to consolidate bad credit or high-interest loans. You don’t have to be locked out of the credit system for a few bad mistakes. Understanding how the system works is the first step to rebuilding your score. I used these tricks to fix my credit score in six months and to boost it by hundreds of points over the last few years.